Taishan Mountain is endowed with many scenic spots. A large number of them were given names in ancient times. They include 112 peaks, 98 precipices, 18 caves, 58 oddly shaped rocks, 102 streams and valleys, 56 pools and waterfalls, and 64 springs. Vegetation covers 79.9% of the area. The flora is known to comprise 989 species in 144 families. Taishan Mountain also boasts cultural heritage with an incessant history of several thousand years. Currently on the mountain, there are 22 ancient architectural complexes, 97 ruins, 819 stone tablets and 1,800 stone inscriptions, which provide a natural museum for the study of ancient history and calligraphy. Main sites of interest are the Tiankuang Temple, Nantian Gate, Azure Cloud Temple, Peak for Viewing the Sun, and Sutra Rock Valley, etc. Taishan Mountain is one of the birthplaces of the ancient Chinese civilization along the Yellow River. 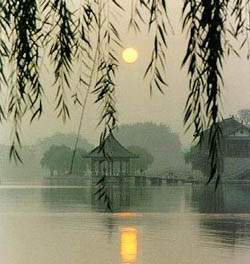 Evidence of human activities includes two flourishing cultures -- the Dawenkou Culture to the north and the Longshan Culture to the south of the mountain. During the Warring States Period, a 500-kilometer-long wall was built from Taishan Mountain to the Yellow Sea. Scenic spots related to the famous ancient sage Confucius are the Confucian Temple, places where Confucius climbed Taishan Mountain and viewed the scenery, etc. Taishan Mountain has an extremely rich cultural heritage. It has always been regarded as pre-eminent among China's five sacred mountains. It was also a symbol of power. Emperors of different dynasties have made pilgrimages to it for sacrificial purposes shortly after they came to the throne or when the land enjoyed peaceful and prosperous times. 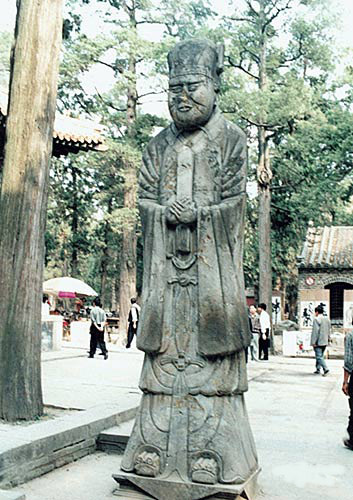 Poets and literary scholars of each dynasty also visited Taishan Mountain. Numerous rock inscriptions and stone tablets bear testimony to such visits. Renowned scholars, including Confucius, Sima Qian, Cao Zhi, Li Bai, Du Fu, composed poetry and prose and left their calligraphy on the mountain. The currently preserved 97 sites and 22 ancient building complexes provide materials for research into China's ancient architecture. Taishan Mountain rises abruptly to 1,300 meters above the vast plain of north China. The sharp contrast between Taishan Mountain and its surrounding plain and hills makes it especially majestic. Taishan Mountain rises from about 150 meters above sea level (north of Tai'an City), to the Middle Gate to Heaven at 847 meters, to the Southern Gate to Heaven at 1,460 meters, and finally to the Jade Emperor Peak at 1,545 meters. Standing in the central part of Shandong, the mountain stretches 100 kilometers. Its base covers an area of 426 square kilometers. The wide base and huge body of the mountain gives an impression of solidity and dignity. Taishan Mountain is a symbol of loftiness and grandeur, characterized by numerous old but still green pines and cypresses, towering precipices comprising metamorphic rock and granite, and ever-changing seas of clouds. Taishan Mountain is also called Daishan, Daizong or Taiyue. Taishan Mountain lies west of the Yellow Sea and east of the Yellow River, spanning Tai'an City in the south and Jinan City in the north. The scenic area covers 125 square kilometers. Its main peak (Jade Emperor Peak) is 1,545 meters high. It is 8.9 kilometers from the Temple of the God of Taishan Mountain at the foot of the mountain to the Jade Emperor Peak, with over 6,660 steps, 60 major scenic sites, and nearly 1,000 cliffside sculptures and over 200 stone tablets. 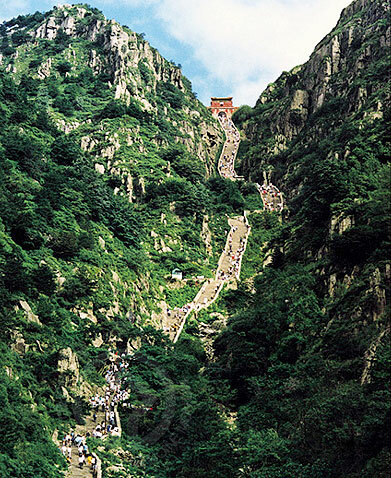 Taishan Mountain is regarded as preeminent among the Five Sacred Mountains.